1.Using the 8th thread from the left, make 4 fk. 2.Repeat step 1 with the 7th, 6th, and 5th threads. 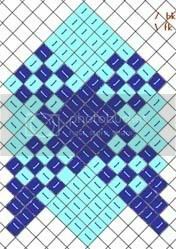 3.For the next same colour diamond, make bks using the 9th, 10th, 11th and 12th threads. This uses up the threads more evenly. 1.With the 5th thread, make 1 fk; 3rd=1 bk; 3rd=1 fk; 1st=1 bk. 2.With the 5th thread, make 1 bk; 5th=1 fk; 3rd=1 bk; 3rd=1 fk. 3.With the 7th thread, make 1 fk; 5th=1 bk; 5th=1 fk; 3rd=1 bk. 4.With the 7th thread, make 1 bk; 7th=1 fk; 5th=1 bk; 5th=1 fk. 1.With the 4th thread, make 1 fk; 6th=1 bk; 6th=1 fk; 8th=1 bk. 2.With the 4th thread, make 1 bk; 4th=1 fk; 6th=1 bk; 6th=1 fk. 3.With the 2nd thread, make 1 fk; 4th=1 bk; 4th=1 fk; 6th=1 bk. 4.With the 2nd thread, make 1 bk; 2nd=1 fk; 4th=1 bk; 4th=1 fk. With the first thread on the right, make 3 bk. With the first thread on the right, make 2 bk. With the first thread on the right, make 1 bk. Repeat right triangle, substituting knots.